This is the TR from my little trip to Yosemite. The "Jim" referred to here is Jim Shaw, who Bill knows. I left LA at 4 am on Tuesday morning, the 10th and by about 9:15 was at the Wawona gate. R2 chain controls were on from the gate, but I have 4wd, so no need to chain up. A good idea though as I found out later. 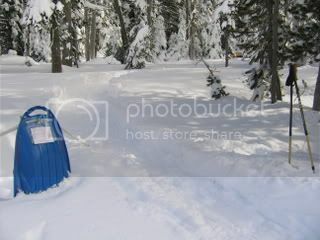 Got to Badger Pass around 10 am, got my permit and headed down the Glacier Point Road on skis towing my sled. A pretty easy ski to the Dewey Point trail, where I turned off. 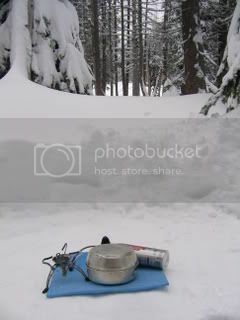 The trail was pretty well packed down by snowshoers, but a little narrow, so the sled was dragging a bit-not the sled so much as my duffle bag on it. After a while, I realized I should have put my skins on before going off road, so I stopped and did that-big difference. 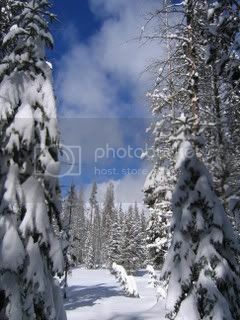 I went about 3/4 mile or so-almost to the end of the big meadow and then dragged my sled through about 2 feet of powder until I found a little clearing about 25 yards or so off the trail. 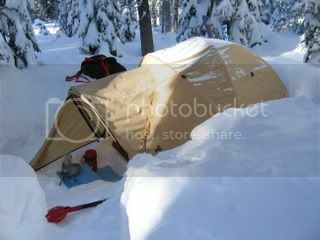 It took me a good half hour or more to stomp down a platform for my tent, the snow was so deep and fluffy-not a lot of water in it. I had plenty of daylight, so not a problem. Got the tent set up, dug out a footwell and kitchen area in front of me, put all my gear away and took a nap. Long story short-it snowed on and off from Tuesday through Saturday. I didn't really go anywhere else-just fiddled with my gear, did some reading. Spent a fair amount of time digging out the tent each morning. My camera was acting up, so didn't take a lot of pics either. 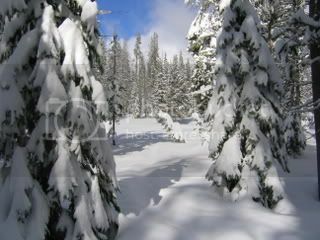 Saturday I heard from some dayhikers that the weather was supposed to really get bad and I was supposed to meet friends that night at a cabin we had rented at Wawona, so I decided that I might not get out without snowshoes, since the snow was so deep and my skis weren't likely to float enough. So, I skied with just a light pack back to Badger Pass, rented snowshoes, skiied back, packed up my gear and snowshoed back to the road. The track was actually packed down pretty good, so it wasn't as hard as I though it might be, all things considered. 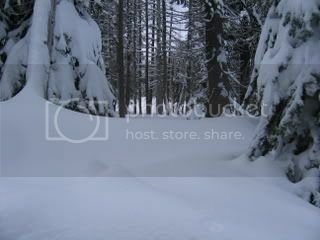 I snowshoed back until I got to the downhill part of the road, switched to skis, then skiied the rest of the way. I had to dig out my car a bit, and wound up packing up in the dark. By the time I got to the cabin, I was pretty knackered, but my friends were surprised to see me since I'd called one of them and told her I thought I might not get out until Sunday. An overbag is a pain in the ***, but it worked. I was toasty warm and it got pretty darn cold. I used by parka as an additional "blanket;"
A pair of mukluks would have been nice for just around camp or for wearing with snowshoes. Here are some pics-the weird one I'm putting up just to show what my camera was doing-the chip is dying. The drive out on Monday. I had met my friends Saturday night and stayed at the cabin till Monday morning. 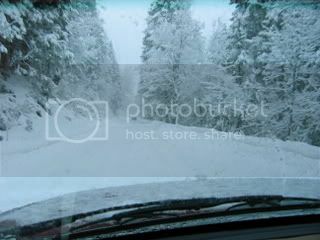 Heavy snow and ice on the road. The Grapevine was closed (the direct route to LA), so we had to drive to the coast-added an extra 180 miles and turned a 6 hour trip into a 14 hour drive because of the extra miles and stops, including a blown tire on another car in our group that I stopped to help. Man I would love to do that, we have some snow around here (S. Appalachians) but it is short lived and wet. Nice pictures! What is your Serius Balaclava made from? Did you take a full size shovel, the red object in front of your tent? I have a pair of Mukluks I got as a gift, do they work well for snow shoeing? BTW I was taught, better to have to much than to little. Great report Tom. An amazing amount of snow! Any idea of the day and night temps? You are correct that overbags are a PITA. Unfortunately the solution, a single bag, costs a lot of money for something that in my case just won't get used enough to justify the price. The Serius balaclava is fleece. Got it at REI. The shovel is a Voile Mini. Got it at REI too. See it on the Voile website. It has a smaller blade than the full size ones and a break-down handle. Perfect for camping. Always get a metal blade shovel, btw, a plastic one won't cut through ice. I don't have mukluks, but they should work for snowshoeing. Which ones do you have? Stegers are used for snowshoeing by a lot of people. I just wore my ski boots since that's what I had with me. 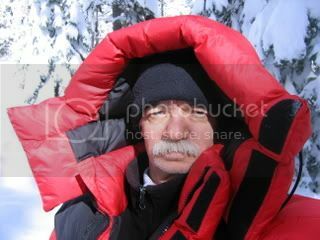 The temps were low 20's F, but a day hiker I saw said it had gotten down to 12F one night. Sometimes in Yosemite, it gets really hot in the day, but not on this trip, at least not at 7200ft. The temp range from night and day was only a few degrees. Yes Tom I do have Stegers, I have the short Ojibwas with a felt liner. I have not used them much really, just around in the yard so far. I have a pair of moccasins that I take as a camp shoe and I love them. I was thinking about getting a pair of the Arctics. How do you like them? So far I really like them, some of that is admittidly just because I think they are cool, they are actually quite comfortable. I do not know how my feet would feel after 10 miles yet, the mukluks do not offer as much support as my boots, but the mukluks may do just fine in snow vs. the rocky terrain I use my heavy boots for. They feel very much like my old Sorels, you can pull out the felt liners and wear them in your tent to keep your feet warm, but shouldn't be rough on a tent floor. Like I said I haven't actually field tested them yet, but I used to carry Sorels in winter and the Mukluks seem very similar in function but better construction than the Sorels I had. Thanks Trouthunter. I bet you could put some kind of orthotic in them for foot support. I do that in ski boots I rent-pull out the standard footbed and put in my Superfeet-they aren't custom, but they do give better support than the flimsy stock ones. The temperatures were perfect for winter camping. Too warm and the snow melts and it's hard to stay dry. Mukluks - I've not tried this, but Dan Cooke tells me people who need more support wear a running shoe inside his mukluks. Dan told me several Iditarod races do this. I used a pair of his mukluks snowshoeing and they worked fine - warm and light. I wore them with wool socks inside, no shoes or footbeds. I actually liked the temps-you are right about snow melt. It wasn't all that bad surprisingly enough. I guess I have figured out how to keep warm, at least in those temps. I've looked at the Cooke mukluks. I think they are more than what I am looking for. For an expedition, or super cold weather, they look like they'd work really well. Great report Tom. I actually kinda like that pic that you put up showing how the camera is messing up on you. Pretty cool actually. If you haven't been there before, let us know. I have a few tips for you, but don't want to bore you if you are a Yosemite veteran. I for one love Yosemite N.P. in February. I have been there in February and the first of March. My last trip started at the Badger Pass Trail head climbed the hill to get up to 'Old' Glacier Point Road, proceeded down to the area behind Bridalveil camp grounds. If you see more than six people, it has been a crowded day! That is where we camped that night. The next day took a short trip to Peregoy Meadow and set up camp, later explored the area north towards Bridalveil Creek. When there are too many people in the city, going to Yosemite N.P. 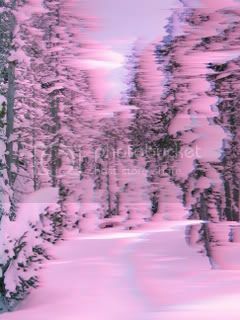 in the winter is a great way to get away from humanity.